Reel Talent is the name of the latest slot from the upcoming games provider Just For The Win, and right now they are hosting a big competition to celebrate the release. Play the game at Casino Heroes for a chance of winning one of 254 real cash prizes! Just For The Win has just released a new slot called Reel Talent. The goal of the game is to chain together consecutive wins in order to trigger the bonus round with eliminated symbols. It’s a unique slot with a fun twist, and by playing it at Casino Heroes you have a chance of bagging a sweet extra prize. For every £25 you wager through on Reel Talent until midnight on the 20th of November you will get one ticket into the draw. There is no limit to the number of tickets you can collect, so you can increase your winning chances by earning multiple tickets. There are a total of 254 prizes up for grabs, and the top prize is £4,500. The best part is that the cash prizes are completely wager free, so you can withdraw the money immediately. The raffle takes place on the 22th of November, and the prizes will be added to the winners’ accounts shortly after. Play Reel Talent at Casino Heroes this week and show everyone who’s the next big slot talent! Head over to the promotion page at Casino Heroes for the complete list of prizes. 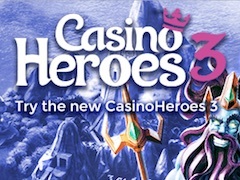 Casino Heroes is one of the most innovative UK casinos on the internet. Not only can you enjoy hundreds of slots and table games, the site itself takes you on an exciting journey. Once you have registered an account and chosen a hero you must land on one of the three islands. As you play games and level up you will face pesky bosses that are standing in your way. If you manage to beat a boss you will be rewarded with treasure chests containing bonus spins or shiny rubies! Boost your deposits with bonuses or go for the bonus spins, the choice is all yours. Note that the bonuses and bonus spins have a wagering requirement of x40. Casino Heroes’ bonus terms and conditions apply.